What are the ingredients that make you think of fall, besides the obvious squash and apples? The produce that seduced me on my last shopping trip were golden beets and pomegranates. I bought both without a recipe in mind, but when I walked into my kitchen their fate was obvious – they would make the perfect fall salad. I roasted the beets and paired the two with cubes of piquant blue cheese and a balsamic vinaigrette. It was so delicious, it’s definitely going to become a fall tradition. The dressing was inspired by a recipe from Food & Wine. The amounts below will make salads for at least 4, if not twice that. I kept the ingredients in the fridge and mixed salads as needed. For an unusual but delicious pairing, try the salad with Hitachino Nest “Real Ginger Brew“. 1. Preheat your oven to 400. Cut the greens off the beets (don’t throw them out, they’re delicious sauteed with garlic). Peel the beets and cut into cubes or wedges. Toss with olive oil, and if desired, a bit of salt and white pepper. Roast on a cookie tray until tender, about 30-45 minutes (depending on how large the pieces are). 2. Peel the pomegranate and remove the seeds to a little bowl. Cut the blue cheese into 1/4 in. cubes. 3. To make the dressing, blend all dressing ingredients for about a minute. My Oster Beehive blender has a great mini jar that’s perfect for making and storing dressings. 4. 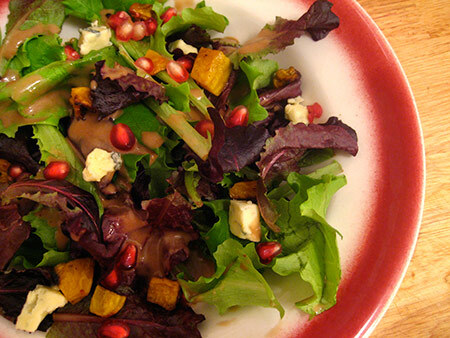 Toss salad with dressing and garnish with cheese, pomegranate seeds and roasted beets.